If you can imagine a shot, Olympus has the ideal lens to capture it. The PEN-F is at the center of an extensive line-up of M.Zuiko Premium digital lenses. Like the camera itself, these lenses are fast, compact, and built to exceedingly high standards. There's also a wide variety of M.Zuiko PRO, standard, and body cap lenses available to match any shooting situation. The PEN-F's cool vintage style extends to the accessories. They're specially designed to complement the camera's unique look and include a bag, a luxurious wrapping cloth, and genuine leather straps. The body jacket accentuates the camera's retro design and offers protection from scratching. A customized metal grip with ARCA-compatible rails adds comfort, convenience, and style. You love photography that's distinctive and film-like. PEN-F's creative dial creates the rich textures of film without all the post work. Just set, compose, and shoot using live view. Spin the front-mounted dial to easily switch between four main functions: monochrome profile control, color profile control, art filters, and color creator. Use the profile control options to precisely set the saturation of twelve individual colors, curves, shading, and monochrome film grain effect. Create and save your own profiles. PEN-F's 20 MP Live MOS Image Sensor and TruePic VII Image Processor work together to deliver the superior resolution professional street photographers demand. If you're shooting landscapes or architecture, the 50 MP High Res Shot Mode combines eight images in one second to create a single super-high resolution shot. 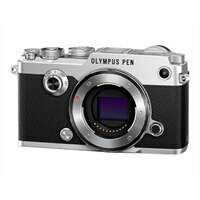 PEN-F boasts a 1/8000 mechanical shutter with the shortest release time of any compact system camera, giving you blazing 10 fps sequential shooting to capture the spontaneity of the street. See the world in perspective. PEN-F's interactive electronic viewfinder allows you to maintain full control of the camera's settings without taking your eye off your subject. Compose your shot in the bright 2.36 million-dot OLED viewfinder with 100% field of view. The 3.0" articulating monitor doubles as an AF Targeting Pad - touch the monitor with your thumb to set focus points while composing your shot. And use the Simulated Optical Viewfinder Mode to see your surroundings just as you would with the naked eye.